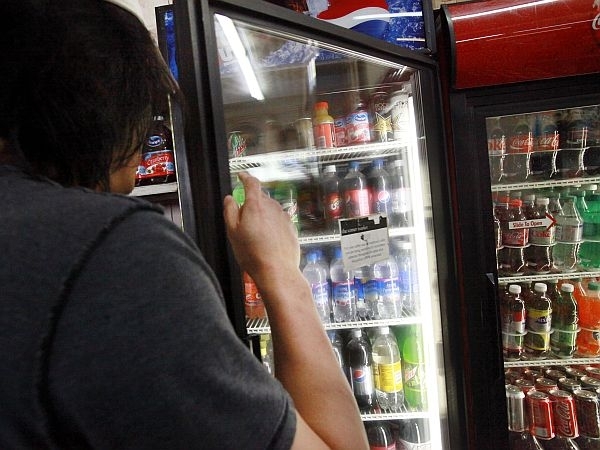 (Host) A new study that links the consumption of sugar to a number of serious health problems is reviving interest in a proposal to tax all sugar-sweetened beverages. Backers of the plan say the bill could raise as much as 27 million dollars a year. But opponents say the idea has some serious problems. (Kinzel) The tax would be roughly a penny per ounce. So a two-liter bottle of sugar-sweetened soda would cost an additional 64 cents. (Sterling) "The reason to tax is people are consuming too much and it really is having an adverse impact on health, especially for kids. For children who consume an extra can or a glass of soda a day, it increases their chance of becoming obese by 60 percent. It also increases their chance of getting diabetes." (Kinzel) Sterling says the tax would raise roughly $27 million a year. And he says this money would be allocated to three important initiatives. (Sterling) "The proposal is one to help lower health care costs for programs like Dr. Dynosaur and Catamount Health. And then other parts of the proposal would be to subsidize the cost of buying fresh fruits and vegetables for low-income people. And third, would be to do a public education campaign on the dangers of obesity, how to decrease obesity and, importantly, the link between excess sugar-sweetened beverage consumption and obesity in Vermont." (Kinzel) Jim Harrison is the executive director of the Vermont Grocers Association. He doesn’t think imposing this tax will do very much to discourage the consumption of these products. (Harrison) "Taxes don’t make people healthier and nor will a tax on sweetened beverages make people healthier. It’s something we individually have to take responsibility for, watch what we consume, know what we consume, and get the exercise that we all need to stay healthier." (Harrison) "This tax is regressive. It sends commerce across our state borders because the bordering states do not have this tax. And it really does smack of an attitude that Montpelier knows best." (Kinzel) Harrison says the tax would be imposed at the wholesale level and he thinks some larger retailers could keep their soda prices low by shifting the cost to other products.